New Auburn is the setting for the book Population 485: Meeting Your Neighbors One Siren at a Time, by Michael Perry. A village with fewer than 600 people, New Auburn is about 35 miles north of Eau Claire and 30 miles south of Rice Lake. 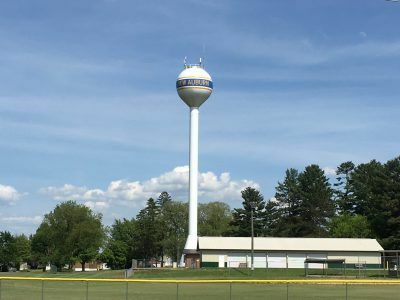 The village straddles the line between Barron and Chippewa counties, leaving the school in Barron county and the town hall in Chippewa county. New Auburn is a great place to camp and fish in the summer and snowmobile in the winter. The area is frequently visited by those looking to enjoy the beautiful lakes this region offers. Originally dominated by the lumber industry, after the land was cleared, the area was planted, and agriculture became the main industry. The Chippewa Moraine area offers magnificent geological history. Also, New Auburn’s Ice Age Interpretive Center is a great place to learn about the Ice Age National Scenic Trail and to begin your hike. The New Auburn School District is a pre-K through 12th grade public school offering big opportunities for students. From athletics to academics, students can enjoy the small-town atmosphere with an excellent reputation for preparing students for future careers. Welcome to New Auburn! We love our town and we hope you do too! Learn more about our school, recreation, and more. Reach us by email, or get the mailing address and phone number for the Village Hall. Check the official notices page for meetings, ordinances and policy updates for the Village of New Auburn. The Village of New Auburn maintains the integrity and quality of life characterized by small-town living, open space, and agricultural land uses with support for commercial and industrial growth. Recreational amenities abound in and around the Village. As the gateway to the Blue Diamond Resort Area and the Ice Age Trail, the Village sees numerous visitors year-round that enjoy community activities and recreation facilities. The New Auburn School District offers high-quality education, preparing area children for successful careers. The Village continues to provide desired public services while remaining fiscally responsible. Additional tax base expansion is supported through well-planned and attractive residential, commercial and industrial development.